Few of us can forget the images of starving children from the Biafran war. Stick thin arms, swollen bellies, blank expressions, but what caused the war and what was it really about? In the novel, there are three characters whose lives tell the story. Ugwu, a poor houseboy who works for a University professor and develops a passion for writing. Olanna, a young woman who abandons her life of privilege to live with her revolutionary and charismatic lover. 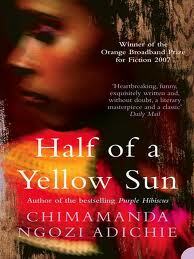 Richard, an English writer who comes as an expatriate and never leaves Nigeria or Olanna’s twin sister. Earlier this year I heard Adichie speak at a book conference. Her written and spoken voice is insightful, important, and articulate. Though she has studied at Harvard and Yale, she is dedicated to promoting the writer’s craft in her home country of Nigeria, leading yearly workshops in Lagos.